The Victor Talking Machine Company was incorporated in Camden, New Jersey in October of 1901, and expanded rapidly there. Camden is located East of Philadelphia, just across the Delaware River, which divides New Jersey from Pennsylvania. With the growth of gramophone recordings, their variety and their quality, there was an increasing need to record groups, rather than individual singers or small groups of musicians. Consequently, the recording locations which had been used for earlier acoustic recordings was inadequate for such larger groups. The Victor Talking Machine Company's original recording studio (or laboratory as it was often called in earlier days) was located on the southwest corner of Front and Cooper Street in Camden 1. This location was surrounded on all sides by Victor factory buildings. Another early recording location was the top floor of a production factory on the northwest corner of Front and Cooper Street 1. Using the top floors of a building for recording allowed Victor to use weights to power the acoustic disk cutting mechanism, without the use of motors which had been found to be noisy and variable in speed. The two Victor locations used prior to 1917 had two deficiencies. First, both locations were too small for larger groups, let alone symphony orchestras. Second, being surrounded by factories, there was too much ambient noise, which was audible in rhw resulting records, given the increasingly sensitive recording instruments. The Victor Executive Office Building, referred to as “Building 2” was completed in 1916 2. 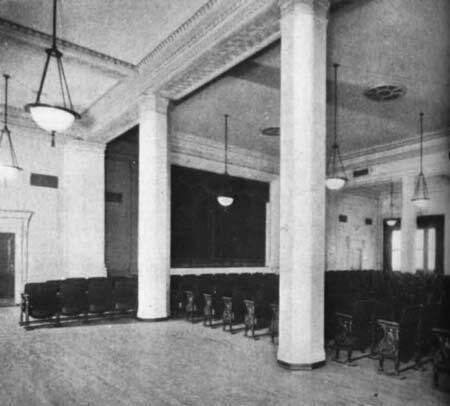 On its Eighth Floor, Victor Building number 2 had a large auditorium, as shown in the picture above. During 1917, Victor began experiments in recording large groups, such as a symphony orchestra. Raymond Sooy (1876-1934), Victor recording engineer wrote: ". ... July, 1917: We started to make Symphony Orchestra records. July 23, 1917: Mr. Pasternack [1878-1940 Music Director of Victor] assembled an orchestra consisting of 51 musicians. The rooms in the general Recording Laboratory not being large enough to carry on this work, we were permitted to use the Auditorium on the eighth floor of the Executive Building ... "
These trials were followed by the historic recording sessions of October 2-5, 1917 of Karl Muck with the Boston Symphony Orchestra, These were followed by the first recording session of Leopold Stokowski and the Philadelphia Orchestra on October 24, 1917. Both the Boston and Philadelphia orchestras used essentially a full-size symphony orchestra of approximately 90-100 musicians. The first Philadelphia Orchestra recording of the Brahms Hungarian Hungarian Dance no 5 was made with 93 musicians: 16 first violins, 15 second violins, 12 violas, 10 celli, 8 basses, 4 oboes, 4 clarinets, 4 bassoons, 3 flutes, a piccolo, 5 horns, 4 trumpets, 3 trombones, a tuba, tympani, and 2 percussion. These October 1917 recordings are remarkably fine in both interpretation and performance, particularly considering they were Victor's and the orchestras' first efforts of recording a full symphony orchestra. Also considering the physical difficulties of recording a large group, and the often unpredictable results of the acoustic recording process. The Muck - Boston Symphony recordings are not only excellent, but provide Muck's only recordings of several works. Since the church building was located amongst the other Victor facilities and was favorable for large groups, both in size and acoustics, it was a logical purchase. Victor removed the bell tower, and renamed it "Building no 22". The ground floor of Victor Building 22 was used first for storage, but during February, 1918, because of its favorable acoustic properties, the Camden Church Studio was constructed by making an upper floor in the main hall of this converted Baptist church, forming a recording studio in the upper levela and later a second studio in the lower level. The upper level of the church was first used for orchestral recording in the 1919 recording sessions, when it was referred to as the "Camden Church Studio", or "Trinity Church Studio". The Camden Church Studio continued to be used for Victor’s recordings until December, 1924, when developments, including the advent of the Western Electric Electrical recording process required changes to "Building 22". In February and March, 1925, a series of electrical recording trials were done in Victor Building 15. Allen Sutton of the superb Mainspring Publishing has documented that Victor's earliest electrical recording session that resulted in a published record occurred on February 26, 1925 with a vocal group which performed what was called Miniature Concert 11. On April 29, 1925 Leopold Stokowski and the Philadelphia Orchestra made their first electrical recording of the Camille Saint-Saëns ‘Danse macabre’ opus 40. You can read about this in 1925 - First Electric Recordings of Leopold Stokowski and the Philadelphia Orchestra. It seems from the commentary of Harry and Raymond Sooy that Studio number 2 on the seventh floor of Victor Building 5 was larger than Studio number 3 on the fifth floor, so presumably, this first Philadelphia Orchestra electrical recording was done in Studio 2 on the seventh floor of Victor Building 15 in Camden. From later comments, and the famous recording pictures of Studio 1, I believe that Studio 1 on the seventh floor of Victor Building 15, after being renovated and equipped for electrical recording may have been the largest of the three studios listed for that building, Studio 2 being the second largest, followed by Studio 3. However, I have not yet seen documentation verifying this. This may indicate that after the first Philadelphia Orchestra records of April 29, 1925 being recorded in Studio 2 of Victor Building 15, that the Tchaikovsky ‘Marche slav’ and the Ippolitov-Ivanov ‘Caucasian Sketches’ recordings of May 14 and 15, 1925 were made in the newly refurbished Studio 1 of Victor Building 15. Certainly this is a minor point, probably of interest only to the most extreme followers of Victor recording history (persons such as myself, I should add). At the time of the installation of the Westrex system, there was also further reconstruction in the Camden Church Studio building to improve acoustics both to the "Camden Church Studio number 2" on the upper floor, and the "Camden Church Studio number 1", with the Estey organ on the lower floor. Camden Church Studio number 2, sometimes referred to as Trinity Church Studio number 2 being on the upper floor of the structure was aided in using the weights still employed to drive the disk cutting mechanism used throughout the 1920s. The electrical circuit of the Westrex electrical recording system was powered by large storage batteries from the Electric Storage Battery Company 15, but the turntable mechanism will still rotated by weights until well into the 1930s, when electric motors that were both quiet and reliable became available. From this information from Harry Sooy, I conclude that the Dvorak Symphony no 9 'From the New World' recording sessions of December 8, 1925, and perhaps also of October 6 and 7, 1925 were done in the Camden Church Studio, which seems to have been the largest, and perhaps acoustically most appropriate recording studio for a symphony orchestra, and probably larger than Studios 1, 2 and 3 in Building 15. Lacking other, different information, this is my assumption for the Dvorak discography (see Leopold Stokowski - Philadelphia Orchestra Chronological Discography of Electrical Recordings 1925-1940). I would also suppose that the last Philadelphia Orchestra recording session in Camden in the 1920s was also done in the Camden Church Studio. This was the session of March 16, 1926, where the first movement of the Caesar Franck Symphony in D minor was recorded, but not issued. The Philadelphia orchestra made all of its recordings in the Academy of Music, their home in Philadelphia from June, 1926, until the end of 1930. 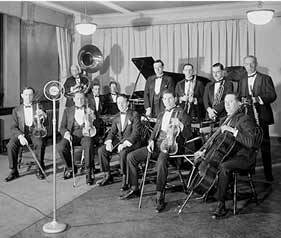 Then, in March, 1931, under RCA Victor (RCA having purchased Victor Talking Machine Company in 1929), the Philadelphia Orchestra returned to the Camden Church Studio for recording. This was to reduce costs during the depression. As further cost savings, RCA Victor also decided to use a reduced number of orchestral musicians, as they had (for other reasons) during the acoustic era. Major orchestral works were often recorded with only 50 musicians. 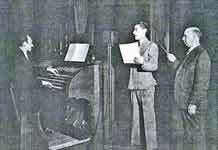 In early 1934, Victor seems to have made further changes to the Camden Church Studio. 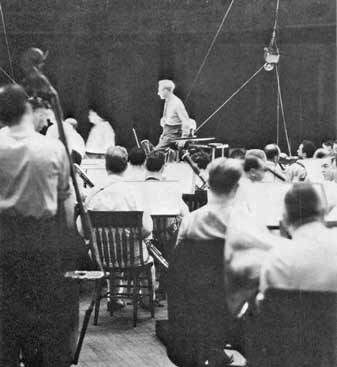 This may be the reason for the Philadelphia Orchestra beginning in March, 1934 recording in the Camden Church Studio number 2 on the upper level, rather than the Camden Church Studio number 1, which they had done beginning in March, 1931. See the recording locations in the Chronological Discography of Electrical Recordings 1925-1940. 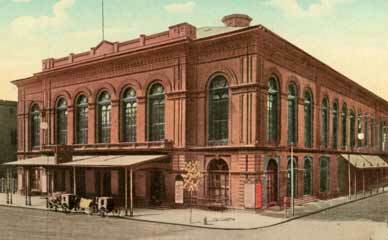 In December, 1935, after nearly five years of recording in Camden, the Philadelphia Orchestra happily returned to recording in the Academy of Music in Philadelphia. This is likely as a result of the city of Camden deciding to extend the Camden subway, with construction near the Camden Church Studio, as described below. Nathanial Shilkret and the International Novelty Orchestra, shown here, most likely at WEAF, the AT&T broadcasting station. AT&T sold WEAF to General Electric in 1926 as part of a settlement with GE/RCA to exit broadcasting, and GE and RCA committed to transmit all their network broadcasts via AT&ampT long distance lines. The International Novelty Orchestra recorded all their electrical recordings in New York, according to John R. Bolig 18, 19. In addition to electrical phonograph record recording, the Camden Church Studio also did some early motion picture sound recording. Beginning in 1927, equipment for recording motion picture sound tracks on disks synchronized with film was added to the Camden Church Studio. One of the first was for Wings starring Clara Bow and Buddy Rogers, with Gary Cooper in one of his earliest roles 17. As well as the Philadelphia Orchestra, many famous Victor artists of the period from 1919 to 1935 recorded in the Camden Church Studio (or later, Camden Church Studios). Enrico Caruso’s later recordings, including his last recording of September 16, 1920, were done there, as well as recordings by John McCormack and Vladimir Horowitz’s first recording in 1927. Arturo Toscanini and the visiting La Scala Orchestra made his first recordings in the Camden Church Studio on December 17, 1920. Among many popular artists, as well as Fats Waller (including, as mentioned, on the Estey Organ) and Jelly Roll Morton, were Duke Ellington and the great Carter Family. 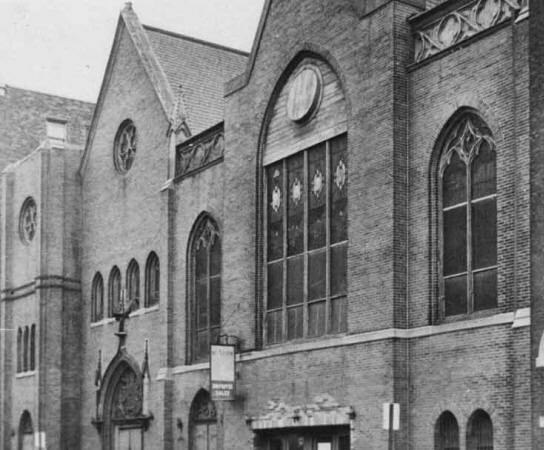 In 1935, the city of Camden decided to extend its subway system below the church location, and first the construction, and later the rumbling subway noise ended the Trinity Church’s role as a famous recording location. Most recording was thereafter moved to New York, or other locations. The Philadelphia Orchestra benefited from this, returning to recording in the Academy of Music in December 1935. RCA Victor then converted the building into a gymnasium for the Victor Athletic Association, and later also added the Employees' Store. Ben Kragting, editor of a Dutch Jazz magazine, who has also been interested in the rich recording history of the Camden Church Studio did some investigation in 2008 on the Philadelphia location, and informed me that unfortunately, the Camden Trinity Church structure no longer exists, presumably torn down some time after 1947.